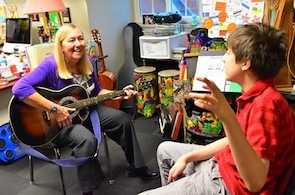 Dr. Blythe LaGasse has worked with children on the autism spectrum (ASD) for many years and also coordinates the Music Therapy program at Colorado State University. “Many persons on the autism spectrum show increased interest in musical stimuli, making music therapy an excellent tool to facilitate achieving their cognitive, social, communication, or motor goals,” she says. facilitating relationships, learning, self-expression, and communication. improving attention span, including gaining and maintaining attention. helping children learn to follow directions. helping children learn to express feelings appropriately, including instances where verbal language isn’t used. facilitating social skills including sharing, interacting appropriately with other children, taking turns, and responding in an acceptable manner. improving verbal skills including rate, volume, and pacing of speech. helping individuals process sensory information. building frustration tolerance including the ability to adjust to changes in routine. developing and improving fine motor skills including grasping, use of the wrist and fingers, and facial movements such as winking. 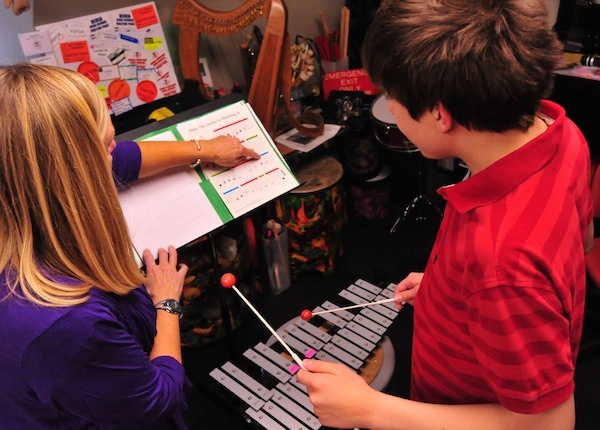 “Each college student studying music therapy has points along their education journey where they evaluate and reevaluate their interests, talents, strengths and challenges in terms of specific areas of practice,” says Lalene Kay. “As students have opportunities to experience working with different populations, they are able to make more realistic decisions regarding populations and their own inclinations and talents for working with specific age groups, diagnoses, and with specific models and approaches. If you’re considering or currently attending, or have graduated from a school that does not offer music therapy but are interested in entering this field, read: Equivalency Program in Music Therapy. Autism Speaks is an international autism advocacy, education and research organization. For additional schools not on this list, visit the website of the AMTA. Is Music Therapy Your Calling? This article was amazing. Thank you so much for sharing such information. Truly touched my life in more ways than one. Truly informative article. Thank you for taking the time to comment. We are so glad you found this article meaningful. My daughter is a psychology major and music minor. She loves kids and is looking to pursue a career in music therapy. What are the possibilities? Many music therapy schools offer an Equivalency Program for those with a bachelor’s degree in music but not music therapy. This makes it possible to get all of the music therapy courses necessary to sit for credentialing exams without having to get a second bachelor’s degree. University of the Pacific is the only school we work with that states that those graduating with related degrees, such as a psychology degree, may also apply. Your daughter should check this out carefully, and also visit the website of the American Music Therapy Association for other possible schools. We suggest your daughter see the following articles to learn more about what’s required to become a music therapist. The school I went to for Handicapped Children also had a department for hearing impaired children. Two times a week I and my classmates were required to attend one period a week there to learn sign language. We also had to learn how to read lips. There have been many times I wish I had kept up with both. The school I went to was the “William S. Baer School” in Baltimore Md. Thanks for this article. It’s amazing how music therapy can be effective with so many different populations, including children and adults with autism. Thanks for your comment, Matt. Children’s hospitals were mentioned in Jennifer Gravish’s remarks at the end of the article, but we agree that it should be listed in the “Employment Opportunities” section. Thank you for bringing this to our attention.